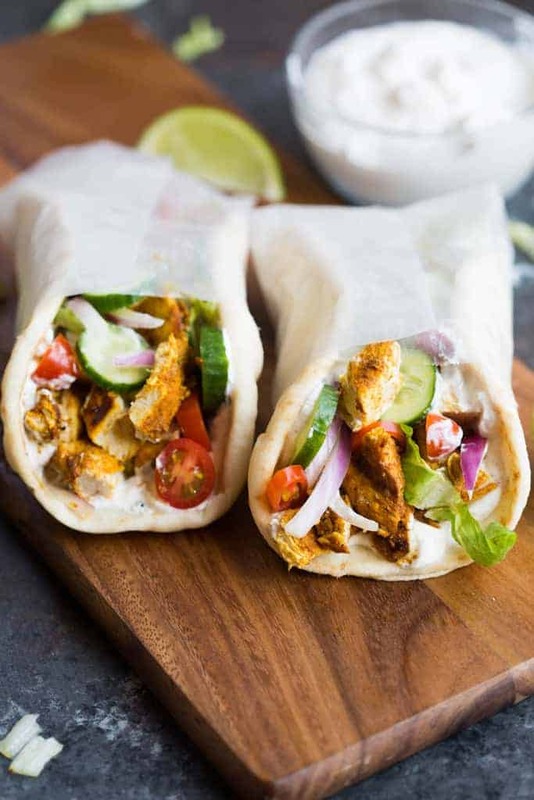 Chicken Gyros include delicious marinated chicken, grilled and layered on a pita with yogurt sauce, lettuce, tomato, onion and cucumber. This fresh and healthy meal idea is one of our family favorites! You know how some parents complain that their kids will only eat certain items, or maybe their repertoire of “favorite” foods, consists of just a few things? Well, I have the opposite problem. My kids are so used to eating “new” and different foods all of the time that they don’t like to eat the same thing two days in a row (unless it’s cottage cheese. My two year-old could live off of cottage cheese 😉 ). If we have pasta for dinner one night, they wont have anything to do with pasta the next day. Peanut butter and jelly sandwiches? Boring. They’re rather have a grilled ham and cheese with honey mustard sauce! haha. I guess it’s not a bad problem to have, but they are pretty hilarious. Life is just too short to eat boring food–am I right? And I guess my kids have learned that early! 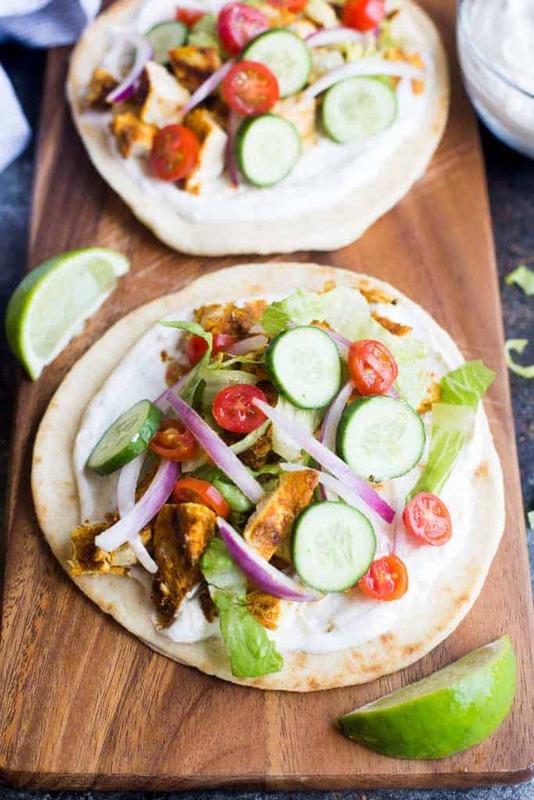 These chicken gyros are anything but boring, and they’re the perfect meal to “mix things up” if you’re feeling in a bit of a dinner rut. Not only is the chicken marinade super easy, but it gives the chicken a delicious bold flavor. Layer it with a tasty greek yogurt sauce (I don’t call it “tzatziki” sauce because I didn’t add cucumber to it), and toppings like lettuce, tomato, onion and cucumber, all served inside a a yummy pita. 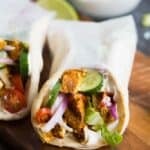 These Chicken Gyros were a favorite with everyone in my family. Combine marinade ingredients in a bowl and whisk until smooth. Add chicken to a large ziplock bag. Pour marinade over chicken and squish everything together to coat well. Marinade for 1-4 hours. Meanwhile, make the yogurt sauce by combining all ingredients. Taste it and add more seasoning (lemon juice, garlic, salt, pepper or cumin) to your liking. Refrigerate. Heat grill to medium. Remove chicken from marinade, letting any excess sauce drip off. Grill chicken for a few minutes on each side, flipping once, until cooked through. Remove to a plate to rest before chopping into bite-size pieces. Toast or warm your pitas/flatbread. 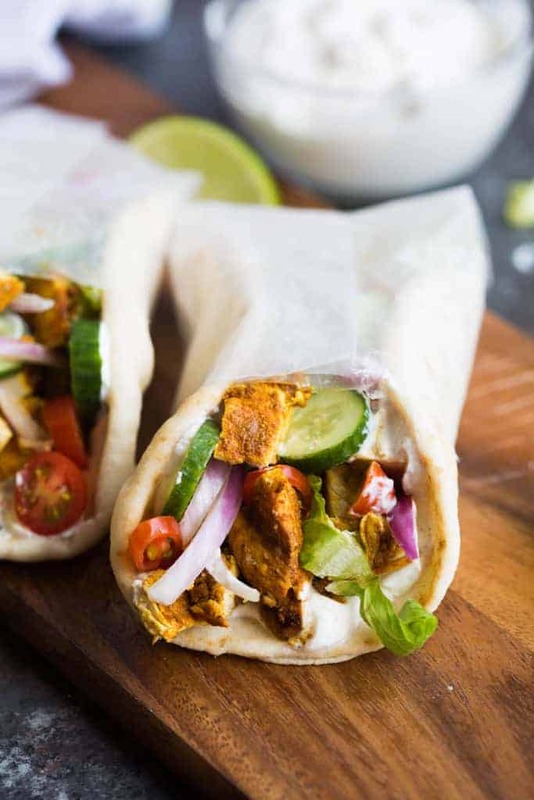 Layer pita with chicken, lettuce, tomato, red onion, cucumber and sauce. Enjoy! *I like to use breast filets, or if you're chicken breasts are really thick you can slice the breast in half, lengthwise (called "butterfly") to make two thinner pieces. Made these for dinner tonight and they did not disappoint. I particularly loved the yogurt sauce. Will make again for sure! Thank you, Lauren! I made these and your spring rolls this week for my family and we really enjoyed them. My daughter told me, “Your dinners this week nailed it!” It doesn’t get any better than that. What a nice compliment, thank you! So happy your family enjoyed the gyros and the spring rolls!